I didn't come all this way to Japan to not eat my favourites! As you may know, I travel to Tokyo at least once a year, for my annual pilgrimage to Tokyo Disney Resort and to see The Honorable Family. And on each trip, I usually come prepared with a list of what to stuff my face with! The best part of this list is that nothing is above 1,000 yen! Fresh as Will Smith sashimi, cut into cubes, served on rice. And for only 800 yen! Everyone says you've gotta try the sushi in Japan, and yes, I agree. But I much prefer just having pieces of sashimi cut up into perfectly-sized cubes and vinegar-seasoned rice, all mixed up in one bowl. 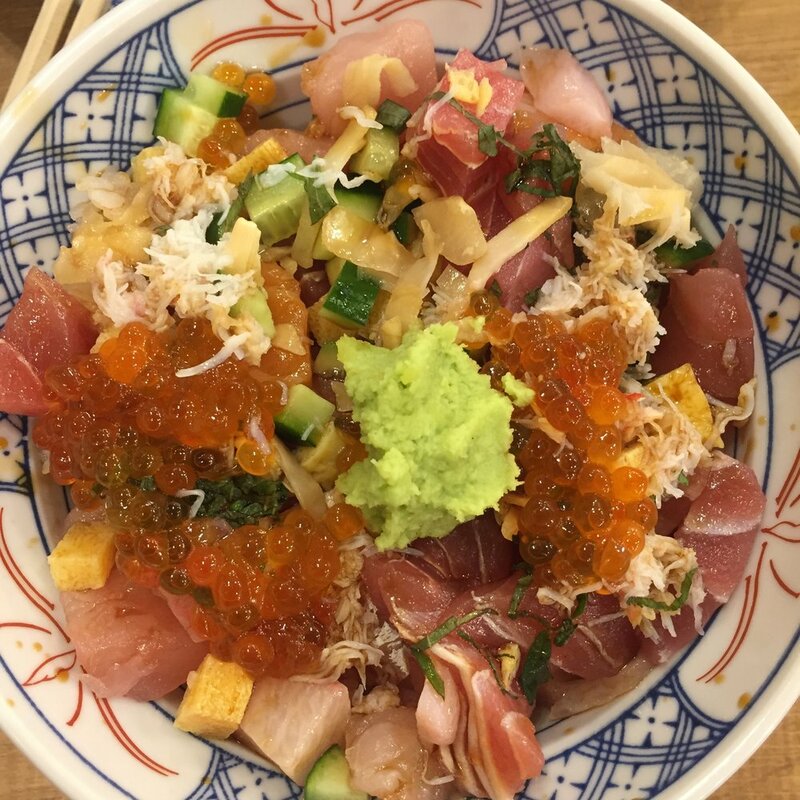 Most sushi places in Japan offer bowls of sashimi-topped rice, and some places have a variety of different types of bowls to choose from, with various ingredients. Sashimi in Japan is often crazy fresh and the balance of the amount of fish to rice is usually spot on. I've never had an issue of finishing my sashimi before I finish my rice! Love, love, love. I can't remember the sauce on this, possibly mentaiko. This photo is actually from 2011. It was the summer of 2011. I was in Tokyo for Summer Sonic featuring Red Hot Chili Peppers. And while the festival was amazing, the gyudon that we found on the way back to our hotel was amazing-er. We were exhausted and it was almost midnight, but we couldn't help ourselves from having a bowl. It was love at first bite, and since then, I have gyudon every single trip. 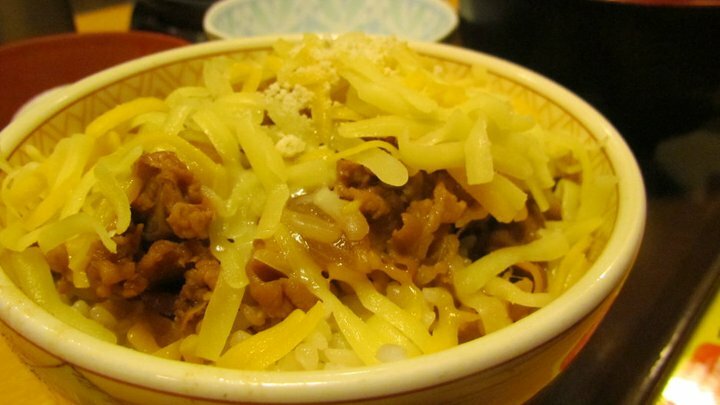 You can find this humble beef rice bowl all over Japan, whether in Yoshinoya, Sukiya or Matsuya. A meal is likely to cost less than 500 yen, and guaranteed to fill you up. A typical winter delight, Oden is sold in most convenience stores. Consisting of various ingredients such as eggs, tofu, fish cakes in a light broth, it is my pick for a late night snack! You can find an Oden counter near to the cashier, and all you have to do is pick a bowl, choose your favourite ingredients, top it off with broth, hand over the money and enjoy. It's the kind of dish that just warms you up from the inside! The photo may not be the best, but that chicken, I swear, sent me right up to heaven. Why fumble with chopsticks when you can have your Okonomiyaki on a stick? Japan is known for its many festivals, and where there's culture, there's often amazing food! We visited Kawagoe during the New Year of 2017 for the Daruma festival and discovered some amazing street food. My favourite? A simple grilled fillet of chicken. So if you ever stumble on festival season while in Japan, be sure to come hungry and try as much as you can! It was in this moment, that my life was forever changed. 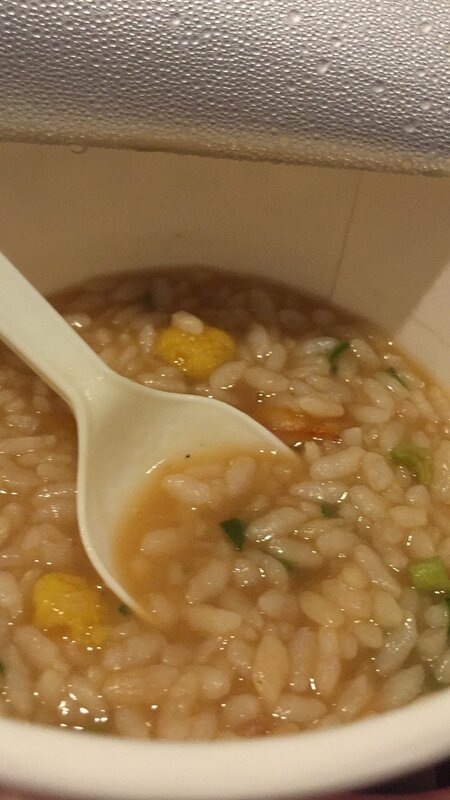 Another life-changing moment found in crazy tasty rice porridge! I'm literally salivating while relooking at these pictures. For a cheap treat, check out the Instant Ramen aisles in the supermarkets. I have a tendency to purchase Nissin-branded cups of goodness, and I love trying their seasonal flavours and new releases. Nissin's 2016 winter special, Milk Seafood, literally reached through my stomach lining and touched my soul. I would have never expect that milk and seafood to go together but my life has never been the same since. On my previous trip to Tokyo in April 2017, I searched like a hound for it and sadly, it was no longer available. And on that trip, I discovered Nissin's Bukkomi Meshi, an amazing treat of rice in ramen soup. While it hasn't displaced Milk Seafood as number one, it was a worthy alternative and a yummy enough stand-in! So there you have it, my top 5 must-eats whenever I'm in Tokyo! What are some of your favourite Japanese foods?